Described as kind, quiet, unassuming and humble, Corbin Wilt served many people while rising to the rank of Sergeant with the Winfield Police Department. Hoping to honor Corbin’s legacy, the Corbin Wilt Memorial Scholarship was created at Cowley College. A number of Corbin’s friends and family members turned out for the announcement of the scholarship Wednesday inside Cowley College’s President’s Dining Hall. Corbin was by his very nature a leader that helped inspire and motivate others. Corbin was raised and educated in Winfield, and graduated from Winfield High School in 1993. He then attended Cowley College, majoring in Criminology. Corbin later attended the KU Law Enforcement Training Facility in Hutchinson, Kansas. He later worked for the Winfield Police Department where he was a sergeant and also served as a volunteer firefighter for the Winfield Fire Department. Sadly, he passed away in 2012. Owens said the idea for a criminal justice scholarship was generated by a class of his. 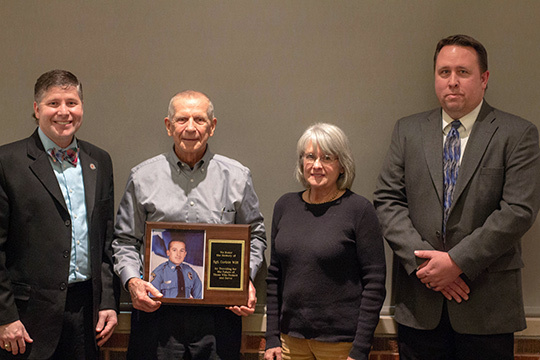 Owens thanked friends of Corbin’s from the Winfield Police Department that were in attendance, and also thanked Winfield Police Chief Robbie DeLong for the Department’s $1,000 donation to the Corbin Wilt Memorial Scholarship. Corbin’s father, Wayne, was a reserve officer with the Winfield Police Department for 19 years before becoming a county commissioner. Corbin’s brother, Roger, is the police chief in Burden, KS, and his other brother, Barclay, is a former sergeant with the Cowley County Sheriff’s Department. Cowley College president Dr. Dennis C. Rittle said the College will work to make this an endowed scholarship. Corbin’s father, Wayne, flanked by his wife, Karen, accepted a plaque honoring Corbin and thanked those in attendance for attending the scholarship reception. To donate to the Corbin Wilt scholarship visit www.cowleyfoundation.org and click on “donate”. Pictured, from left, Dr. Dennis C. Rittle, Wayne Wilt, Karen Wilt, and Frank Owens.